The folks at Schneider Optics announced their new iPro Tele Lens at Macworld | iWorld 2012 this week, an additional iPhone lens for the iPro Lens System. The 2X tele lens narrows the iPhone camera’s field of view by half, bringing the subject of your photo two times closer. I got to test out a prototype of the iPro Tele Lens at the Schneider Optics booth at Macworld, and was impressed. The lens shot very high-quality images—subjects were close, but remained sharp. I imagine it’d be a great solution for people who frequently use the digital zoom on their iPhone camera but hate the grainy results. It’s also a nice lens for iPhoneographers who take a lot of portraits, since you won’t need to get the iPhone right up to subject’s faces to fill the frame. The iPro Tele Lens features Schneider Optics’ bayonet mounting system, which means you’ll have to own the $199 iPro Lens System in order to use it. And the lens itself doesn’t come cheap—it’ll cost an estimated $100 once it’s released in April. But if you’re willing to make the hefty investment, the iPro Tele Lens will certainly make a nice addition to your iPhone lenses. Those looking to improve their iPhone photography with less expensive alternatives, there’s always the $70 Olloclip, which is also showing at Macworld | iWorld, and various other accessories. You can see Schneider Optics and the new iPro Tele Lens at Booth No. 423 in San Francisco’s Moscone West exhibit hall through Saturday. 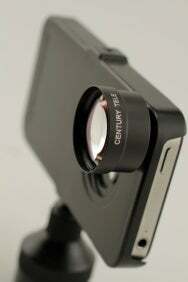 Olloclip is showing its clip-on iPhone lens at Booth No. 939.